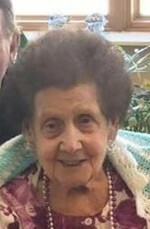 Esther M. Ceresero, 96, Portage County Health Care Center, passed away Sunday, March 24, 2019, at Aspirus Wausau Hospital. She was born June 13, 1922, in Knowlton, the daughter of the late August and Rose (Britz) Schwichtenberg. She married John Ceresero on June 1, 1946, in Knowlton. Esther and John lived and worked in several locations in Wisconsin. They purchased the Rosholt Bakery and ran the business from 1961-1972. Esther was known for her delicious pies, which continued to be in high demand even after selling the bakery. "The Pie Lady" was her nickname. After John's death on Feb 2, 1996, Esther moved to Southern California where she lived for four years before returning to Stevens Point. Esther had an amazing personality and was well loved throughout the area. Her passions were baking, gardening, polka dancing, attending church picnics, and her family. She was a loving mother, grandmother, great grandmother and loving friend. Esther will be fondly remembered and missed. Survivors include a son, Rev. Battista (Nanxi) Ceresero, Neenah; a daughter, Jean (Gary Saeger) Krogwold, Iola; nine grandchildren; 27 great-grandchildren; and four brothers and sisters, Margaret (George) Husa, Rancho Cucamonga, Calif., Gerald Schwichtenberg and Loretta Tombolato, both of Scottsdale, Ariz., and Malana Meyer, Rialto, Calif. She was preceded in death by a son, Jerry Ceresero, two brothers, Otto and Albert Schwichtenberg, and a sister, Marie Holmquist, and her twin sisters, Jean and Jane. To send flowers to the family of Esther M. Ceresero (Schwichtenberg), please visit our Heartfelt Sympathies Store.